Our show season kicks off in January supporting Glossop Caravans at the Caravan & Motorhome Show, Event City, Manchester. Please come along and see our products on display in a variety of caravans including the Swift Celebration, Elddis Chatsworth, Coachman Festival, Pastiche, VIP and Laser. 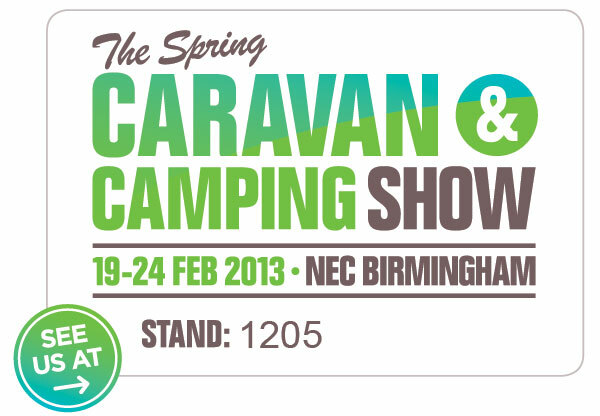 February - We will once again be supporting Coachman Caravans at the Caravan, Camping and Motorhome Show, NEC, Birmingham. We will be dressing all of the fixed beds in the Vision, Pastiche, VIP & Laser models with coordinating bed linen, so we're warming the iron up already !! We will also have bed linen on display in the dealer special caravans on the Glossop Caravans and Broadlane Caravans stands. May - The Southern Motorhome Show - Newbury. Located at the junction of the M4 and A34, this must be one of the most accessible shows on the outdoor calender. June - The Midsummer Motorhome Show - Stoneleigh. The second year of this show in the heart of the Midlands, just a few miles away from the Spa town of Leamington, the wonderful Cathedrals of Coventry (yes, there are two) the fantastic motor museums at Coventry and Gaydon and the stunning Warwick Castle. It has got to be worth a weekend away. October - Back to the NEC supporting Coachman Caravans at the Caravan and Motorhome Show, 16th – 21st. We will be dressing all of the fixed beds in the Vision, Pastiche, VIP & Laser models with coordinating bed linen. We will also have bed linen on display in the dealer special caravans on the Glossop Caravans, Broadlane Caravans & Raymond James caravans stands. We are very pleased to introduce an even wider range of fabrics going into 2017, offering more choice to our customers new and old. We have added 11 colours to our Polycotton percale range, 10 colours to the 200 thread count Egyptian cotton, 8 colours to our 400 thread count Egyptian cotton and 3 colours to our 100% brushed cotton. Please see our Fabrics page for more information. Our show season kicks off in January supporting Glossop Caravans at the Caravan & Motorhome Show, Event City, Manchester, between the 19th-22nd January. Please come along and see our products on display in a variety of caravans including the Swift Celebration, Elddis Chatsworth, Coachman Festival, Pastiche, VIP and Laser. February - We will once again be supporting Coachman Caravans at the Caravan, Camping and Motorhome Show, 21st – 26th February 2017 NEC, Birmingham. We will be dressing all of the fixed beds in the Vision, Pastiche, VIP & Laser models with coordinating bed linen, so we're warming the iron up already !! 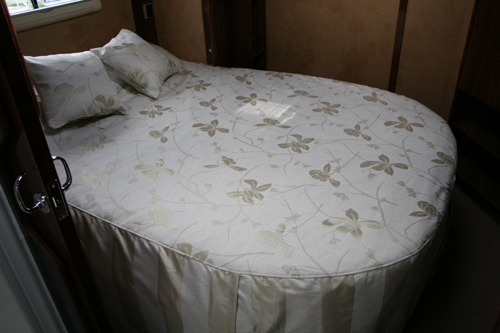 We will also have bed linen on display in the dealer special caravans on the Glossop Caravans and Broadlane Caravans stands. April - Sees the start of the outdoor season during which we will be attending the majority of the Warners (MMM) exhibitions. Come and see us at the National Motorhome Show - Peterborough, 21st-23rd April - Lets just hope the weather's a bit better than in 2016 !! May - The Southern Motorhome Show - Newbury, 19th - 21st May. Just off the junction of the M4 and A34, this must be one of the most accesible shows on the outdoor calender. June - UK Summer Motorhome & Caravan Show 2017, Detling, Maidstone, Kent, 9th - 11th June. This show has been growing year on year so it would be great to see even more visitors to this part of the UK. June - The Midsummer Motorhome Show - Stoneleigh 23rd - 25th June. A brand new show in the heart of the midlands, just a few miles away from the Spa town of Leamington, the wonderful Cathedrals of Coventry (yes, there's two) the fantastic motor museums at Coventry and Gaydon and the stunning Warwick Castle. It has got to be worth a weekend away. 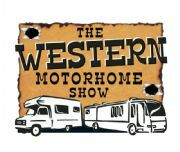 August - The Western Motorhome Show - Three Counties Show Ground, Malvern, 18th - 20th August. Always a fun weekend in the foothills. We were invited to work with Coachman Caravans once again to design a set of bed linen for each of the fixed beds in their 2017 range, including the Vision, Pastiche, VIP & Laser. The caravans and associated bed linen ranges were given their first outing at the dealer launch event closely followed by the Lawns Show in September. If you missed them there, why not come and see them on display at the NEC 11-16th October. It's been another action packed year and we would like to thank everyone that has visited our stand at the various shows we've attended including the NEC, Peterborough, Newbury, Kent & Malvern. The show at Peterborough was particularly challenging this year as we experienced every season in the 4 days, including sleet & snow !!!! Once again we have been working with Coachman Caravans to design a set of bed linen for each of the fixed beds in their 2016 range, including the Vision, Pastiche, VIP & Laser. Well, it's been another hectic summer with outdoor shows at Peterborough, Newbury, Detling in Kent and lets not forget Malvern. The Motorhome & Caravan show at the NEC is fast approaching so why not pop by and see us on the Coachman stand where we will have the full range of Coachman caravans dressed with bed linen. 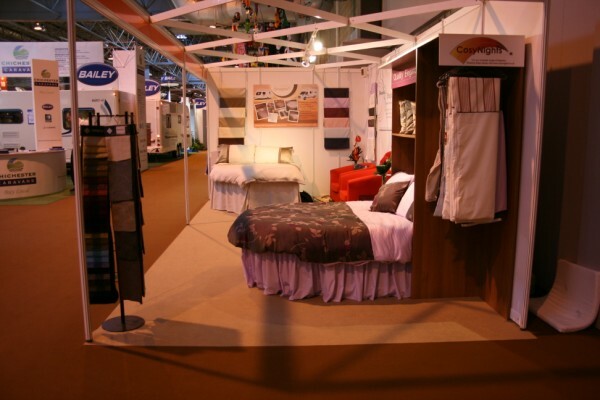 You will also be able to see our products on the Glossop caravans, Broadlane caravans and Raymond James caravans stands. Time to get the iron and ironing board out !! We will once again have a large number of products on display at the caravan, Camping & Motorhome Show at the NEC between the 17th-22nd of February. Our products will be on display in every 2015 Coachman Caravan with a fixed bed on the Coachman Caravan Stand (2200). 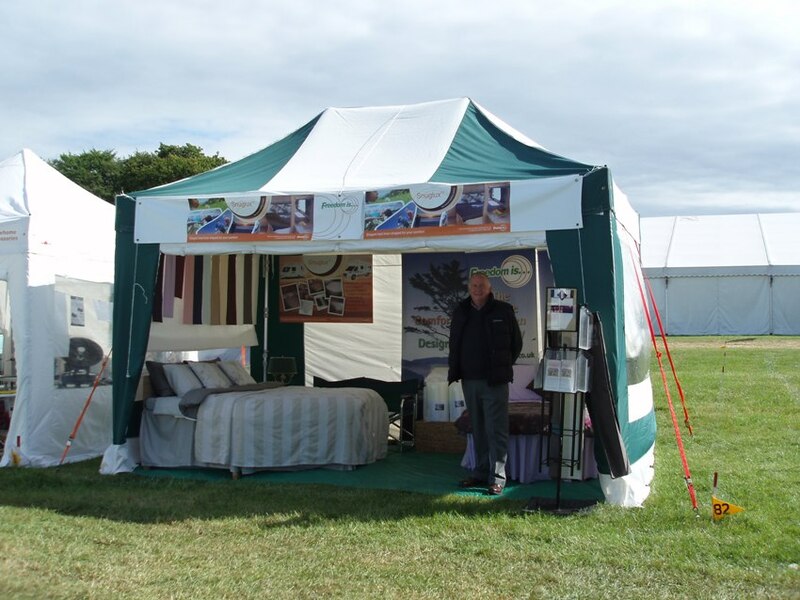 We will also have bed linen on display in the dealer special caravans on the Glossop Caravans Stand (2210) which includes the Coachman Festival, Elddis Chatsworth and Swift Celebration range, as well as the Broad Lane Leisure Stand (1310) Swift Classic and Swift Fairway ranges. Thank you to all those who visited us on the Glossop Caravans Stand at the recent Caravan & Camping show at Event City in Manchester. We had a very busy show and there was a great deal of interest in the bed linen we had designed for both the Dealer special caravans and the Coachman VIP and Laser ranges on display. Thank you to everybody who visited us at the Western Motorhome Show, Three Counties Showground Malvern, from 16th to 18th August. We are featured in a very interesting article, "Between The Sheets", in the July issue of Motorcaravan Motorhome Monthly. It features photographs of our Geisha/Kyoto Throw and Our Asina Duet single duvet sets (even though the article says they are "Ella"). See page 214. We very much enjoyed exhibiting at the National Motorhome Show at the East of England Showground, Peterborough, from 19th to 21st April. We were glad that we had chosen to be in the Exhibition building when gale force winds struck on the first day! Thank you to everyone who visited us. We had a great week at the NEC Spring Caravan and Camping Show with lots of lovely visitors to our stand. 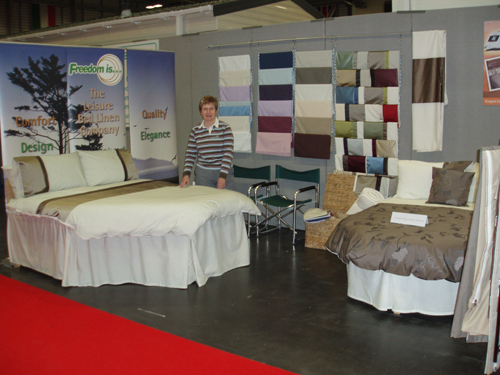 We also had a lot of positive comments and orders from visitors who had seen our specially coordinated bed linen in Coachman Caravans and Broad Lane Leisure's Fairway Range. We had a very positive reaction to our exclusive range of Coachman duvet sets which were on display in Glossop Caravans at the Manchester Event City Caravan and Motorhome Show from 17th to 20th January. You can see our wonderful Snuglux sleeping bags towards the end of Vantage Motorhomes great video. As you can see, they are being used as singles and zipped together as doubles, so versatile! 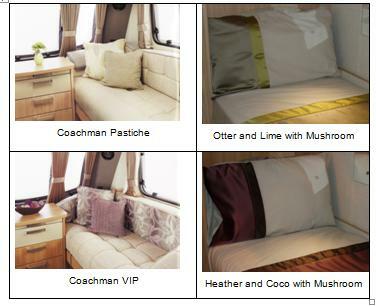 You can now view our new Fabric Recommendations for 2013 caravans. Coordinate your bed linen to your caravan interior with Asina Satin Stripes. Satin stripes can be applied to duvet covers, pillow cases, sleeping bags, and Duo sleeping bags, see our Asina Twin Hoop products. 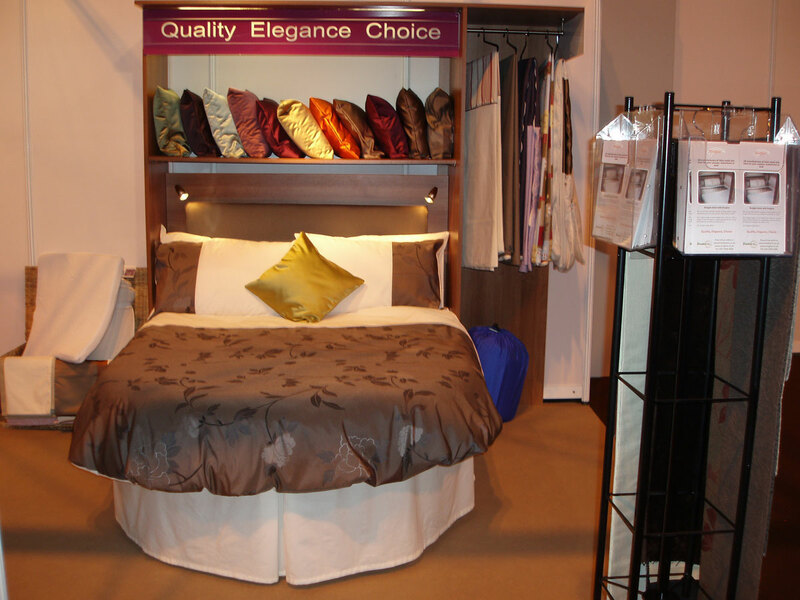 We have worked with Coachman Caravans to design a range of bed linen to complement the interior fabrics in the 2013 Laser, VIP, Pastiche and Amara ranges. 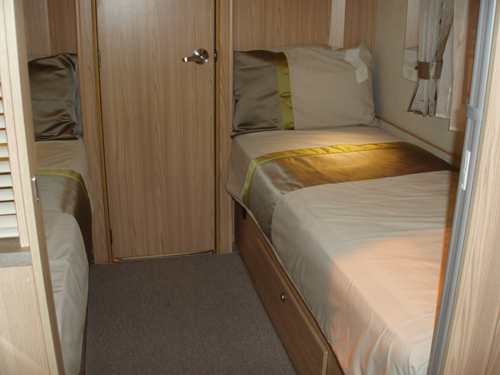 The bed linen is individually tailored to fit the beds in each of the new 2013 layouts. After a wet and windy Friday, the sun came out for the weekend at the Western Motorhome Show, the Three Counties Showground, Malvern. As well as meeting lots of new people, it's always nice to catch up with old friends at the Malvern Show. Despite the cold, wet and windy weather, we enjoyed our weekend at the UK Motorhome Summer Fair at the picturesque Shropshire & West Midlands Showground in Shrewsbury, Shropshire. April 2012, As seen in 60 Minute Makeover! Jamie liked the beds best in his 'new' room in ITV's 60 Minute Makeover on April 19th. Linda Barker agreed "we've got these groovy little sleep pods instead of duvets and sheets, so they're easier to look after." 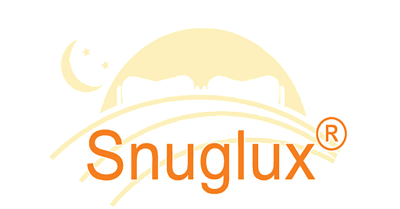 So our Snuglux sleeping bags are "groovy little sleep pods"! We exhibited at the Motorhome, Caravan and Camping Show at ExCeL London from the 14th – 19th February. It was a great opportunity to meet lots of new customers from the South East of England who are generally not very well served with such shows. The daily trip on the Woolwich ferry was quite exciting too! We had a very successful show at the NEC Motorhome and Caravan Show. Thank you to everybody who visited our stand.